This month, newsletter subscribers are in for a real treat. 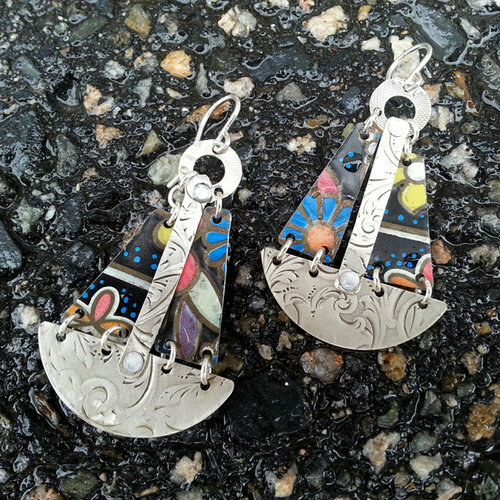 One lucky reader will win a pair (their choosing) of earrings from Juliette Ainsworth's Travel Bug Studio. These earrings are so amazing. First, they are upcycled from old decorative tins that often have floral designs. Next, they are super light and they don't fall off. Thirdly, they are so original. I came to know Juliette when we lived in New Hampshire. We both left the area at the same time, and my daughter and I went on a bit of an earring buying binge before we moved. We just couldn't help ourselves. But now you can find Juliette's work (Travel Bug Studio) online. Be sure to take a peek! UPDATE! Our winner by random generator program thingy is Holly Andrew. Congratulations.